I called this activity The Huffing Fox because this activity involves blowing using a straw. This is such fun activity for kids and a hit for my son N. He blew it more than zillion times until gets tired of it. Ha ha.. This activity makes a great science exploration too for older kids. Kids can compare how different angles of the straw affect the distance the brick house travels. As for my opinion, there are few benefits of playing this activity for toddler too! Fine motor skills -toddler can have opportunity to practice pinching the straw. Coordinating 2 hands to hold the straw straight up and slipping the straw into the plastic pipette. Oral motor skills – obviously! Blowing drinking straw is good exercise for little mouth but it’s a hard work for the little one. Social and Communication skills – little one will request for more of this and we are establishing relationship with them while play. So why not try this activity? Cut the bottom of the pipette and attached the brick house using tape. As for fun, I pasted a wolf cartoon on the straw using a tape. Then, slip a straw into pipette, and you are ready to huff…puff …and blow your house down! Hope your kids enjoy this activity as N did! Since N entered preschool, we have less time doing activities at home than we used to. So I would only do activities that are quick to prepare but still fun for N. N is an imaginative and energetic boy. Every day he plays with his cars and he is a car collectors. So I stumbled upon frugal4boys.com blog who have 4 boys, she has lots of boys activities and cars of course. I decided to do similar activities by making big color graph for sorting and counting. I thought she had a good idea! I drew some vertical lines on the big drawing paper and drew small squares for each line to make the graph. Then, I told N that we need to park all the cars according to their colors. For the start, N chose to do one color first before moving on to the next color. Then, he continued to the next colors. After sorting some of the cars, N refused to sort the rest since he has too many, I guess. But that’s okay, we continue to learn about “more and less” by asking him which color have more cars? And which cars’ color that you have less? Then, we also count the number of cars for each color graph. I hope I can do this activity again with different things! 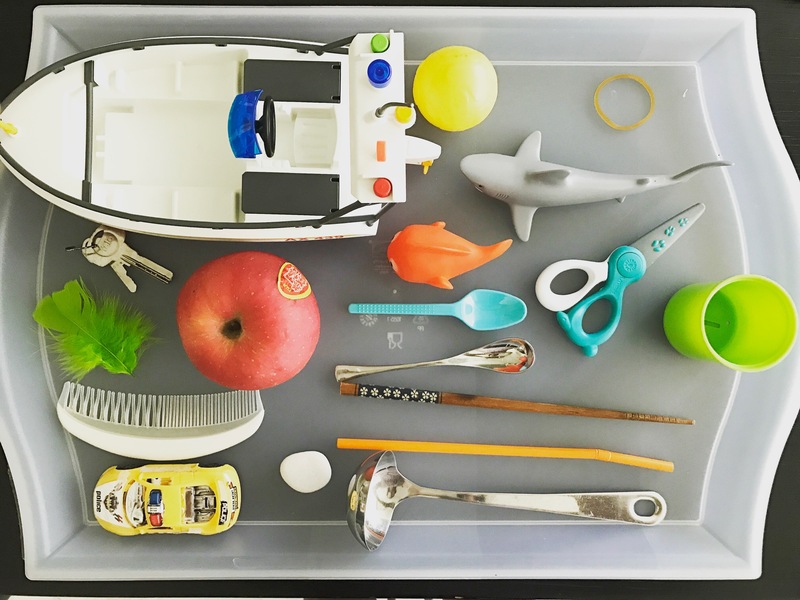 Can you suggest what items are good to use in this activity? Welcome to my very first blog page. Honestly I’m quite nervous about where to start and also what people will think about my blog. On the other hand, I’m just excited and happy that finally I can share my ideas and stories! This will not be happening without my partner in life support. Since 2015, I have started to do toddler activities with my son at home as I think it is important for to gain as much knowledge as they can while they are growing up. I have been documenting what we did since then until now. I still remember what made me realized that activities at home are crucial since N was so difficult to do teeth cleaning and washing his hands. So, I decided to create a one week theme about Hygiene. The result was amazing, he was following all the activities that I prepared, he also want to clean his teeth and wash his hands. N also kept mentioning about a word “germs”. From then on, I committed to myself that I will keep doing toddler activities at home and decided to start sharing our home activities journey. Today is Sunday, we did some exercise this early morning as family so I did not have much time to prep anything but I will just make a quick science activity for N that easy to prep. The topic is about SINKS or FLOATS. First, I collected all the things that are available at home on the tray. Then, fill up the big transparent container with water and write both card papers with sinks and floats. The purpose of big transparent container is for them to see clearly from outside when experimenting. And, the cards that I drew was easier to understand what it means by sinks and floats. N chose his ball toy as his first experiment. 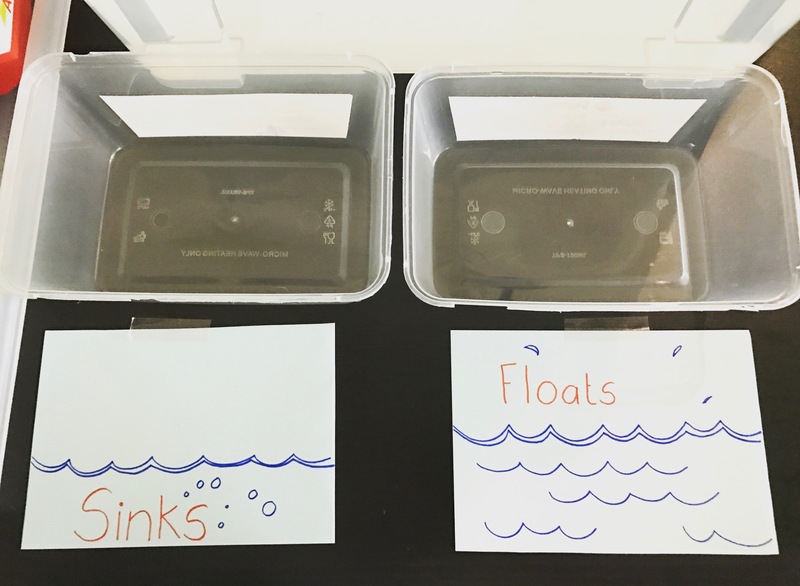 For the first few items, N was still confused the meaning of sinks and floats. But as you can see, he enjoyed and eagerly looked forward what would it turned out when he put each item to the container. After he answered it, he will put the item into the correct medium size container. Then at last minute, I also gave an empty water bottle to let N see whether will it sinks or floats? And how it turned out when an empty water bottle filled with water? 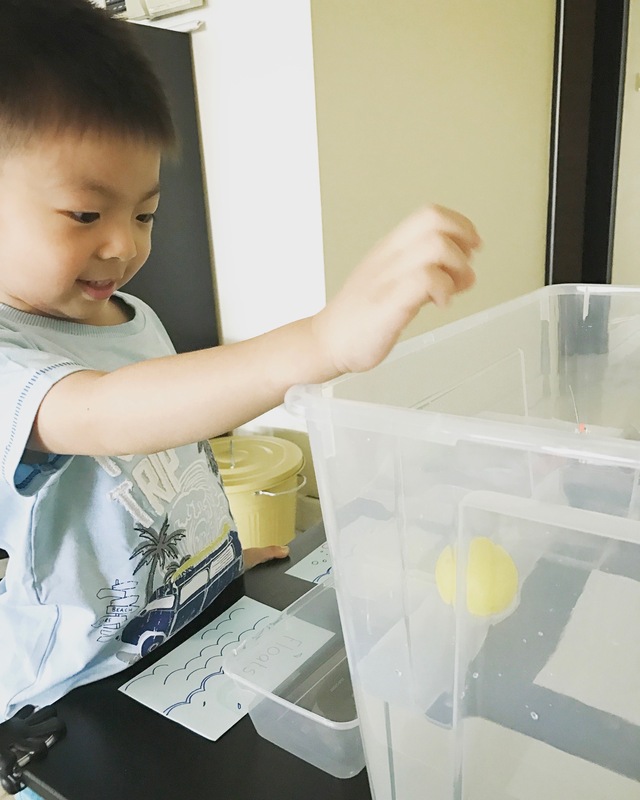 During activity, I often encouraged N to see the item that he put in from the side of the container to get clear view so that he understood more about sinks and floats. Here were all the items that N had proudly put into the correct containers. 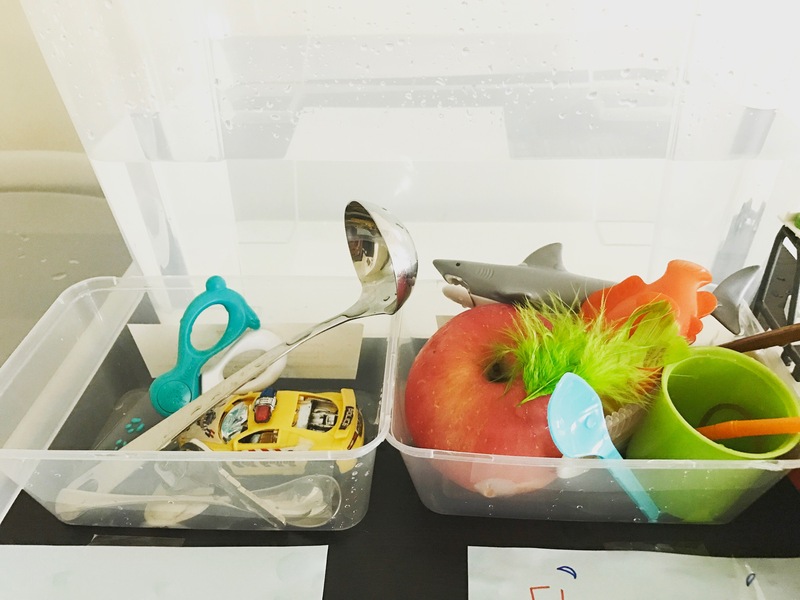 As you can see, I also put some tricky items like stainless tea spoon and plastic tea spoon, if you have older age toddler I suggest to play this as a game. Let them guess first and identify the reason why both teaspoons react differently in the water. I hope my suggestion and share ideas are useful. If anyone would like to know about our previous Hygiene activities that we did, let me know, I would be happy to share it with you guys one day.